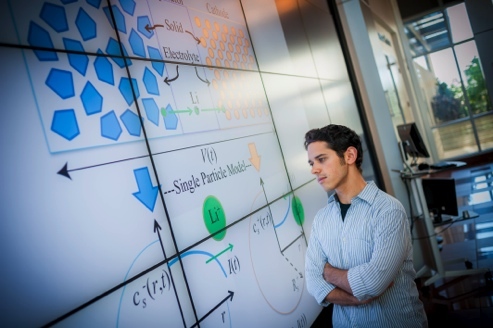 Dr. Scott Moura, a UC Presidential Postdoctoral Fellow, and Professor Miroslav Krstic received a highly competitive award from the Advanced Research Projects Agency – Energy (ARPA-E) to study battery estimation and control. The $4M award will fund research jointly performed between UCSD and industrial partners Robert Bosch LLC and Cobasys. Traditionally, one relies upon current, voltage, and temperature measurements to monitor batteries. The critically important variables related to state-of-charge and state-of-health are, however, immeasurable. This research is radically different in that it uses estimates of immeasurable internal states to impose constraints on battery operation. This enables us to operate batteries at their physical limits, safely. The end result is increased charge rates, power capacity, and energy capacity, while guaranteeing safety and longevity.